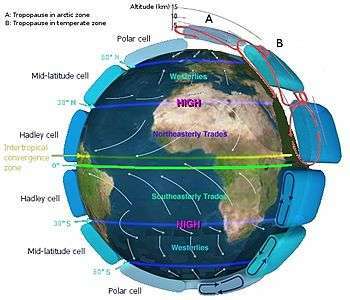 The subtropics are geographic and climate zones located roughly between the tropic circle of latitude at 23.5 latitude (the Tropic of Cancer and Tropic of Capricorn) and temperate latitudes (normally temperate latitudes refer to locations higher than 40 latitude). Subtropical climates are often characterized by warm to hot summers and cool to mild winters with infrequent frost. Most subtropical climates fall into two basic types: 1- Humid Subtropical, where rainfall is often concentrated in the warmest months (for example Brisbane, Australia or Jacksonville, Florida) and 2- Dry summer (or Mediterranean) where seasonal rainfall is concentrated in the cooler months (for example Naples, Italy or Los Angeles, California). A great portion of the world's deserts are located within the subtropics, due to the development of the subtropical ridge. Within savanna regimes in the subtropics, a wet season is seen annually during the summer, which is when most of the yearly rainfall falls. Within Mediterranean climate regimes, the wet season occurs during the winter. Areas bordering warm oceans are prone to locally heavy rainfall from tropical cyclones, which can contribute a significant percentage of the annual rainfall. Plants such as palms, citrus, mango, lychee, and avocado are grown within the subtropics. Tree ferns and sequoia also grow within subtropical climate regimes. 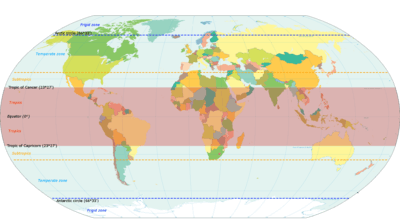 The tropics have been historically defined as lying between the Tropic of Cancer and Tropic of Capricorn, located at 23.45° north and south latitude respectively. The poleward fringe of the subtropics is located at approximately 40° north and south latitude respectively. Northern fringes of the type can go further north due to moderating effects of ocean streams, like in parts of Western Europe due to heat transported by the Gulf Stream. In the Köppen climate classification subtropical climates are classified together with colder temperate climates in the "Warm temperate climates" (letter designation C). The overbroad class C in the Köppen classification lead to newer classification schemes that divide or redefine this class into smaller classes, like the Trewartha climate classification scheme. The humid or monsoon subtropical climate is often located on the western side of the subtropical High. Here, unstable tropical airmasses in summer bring convective overturning and frequent tropical downpours in the hot season. In the winter (dry season) the monsoon retreats, and the drier Trade Winds bring more stable airmass and often dry weather. Areas that have this type of subtropical climate include Australia, Southeast Asia, parts of South America, and the deep south of the United States. . Monsoon regions with a wet season include western Mexico. the Desert Southwest of the United States, Within the Mediterranean climate regime, the west coast of the United States and the Mediterranean coastline of Italy, Greece, and Turkey experience a wet season in the winter months. Similarly, the wet season in the Negev desert of Israel extends from October through May. At the boundary between the Mediterranean and monsoon climates in North America lies the Sonoran desert, which receives the two rainy seasons associated with each climate regime. In locations outside the tropics, other than the drying trend in the winter, subtropical highland climates tend to be essentially identical to an oceanic climate, complete with mild summers, noticeably cooler winters and in some instances, some snowfall. In the tropics, a subtropical highland climate tends to feature spring-like weather year-round. Temperatures here remain relatively constant throughout the year and snowfall is seldom seen. Areas with this climate feature monthly averages below 22 °C (72 °F) but above −3 °C (27 °F) (or 0 °C (32 °F) using American standards). At least one month's average temperature is below 18 °C (64 °F). Without the elevation, many of these regions would likely feature either tropical or humid subtropical climates. These regions usually carry a Cwb or Cfb designation. This type of climate exists in parts of east, south and south-eastern Africa, some mountainous areas across southern Europe, sections of mountainous Latin America, some mountainous areas across Southeast Asia, higher elevations of the southern Appalachians, the Mexican Plateau down past the 19th parallel to Morelos, and parts of the Himalayas. It also occurs in a few areas of Australia, although average high temperatures during summers there tend to be higher and the climate drier than is typical of subtropical highland climates, with maximums sometimes exceeding 40 °C (104 °F). The Mediterranean climate regime resembles the climate of the lands in the Mediterranean Basin, parts of coastal southwestern North America, parts of Western and South Australia, in southwestern South Africa and in parts of central Chile. 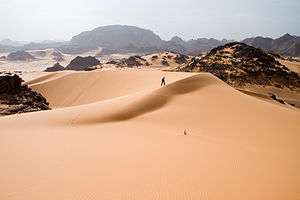 The climate is characterized by hot dry summers and moderate or high rainfall in winter, in areas under the constant influence of the subtropical ridge. Since mediterranean climates are primarily decided by rainfall patterns, climates that are not subtropical temperature-wise can also be mediterranean. For example San Francisco sees average highs in the warmest month below 22 °C (72 °F) with cool nights. Inland from the immediate coastlines, mediterranean climates can take on extreme temperatures. This is seen in inland California as well as Andalusia in Spain. Mediterranean climates can go as far from the equator as 49° latitude north around Vancouver, in places where a rain shadow is prevalent. Drying trends can be found even farther north, but summer precipitation usually remains significant above these latitudes. In Europe, the northernmost mediterranean climates go to around the French Riviera, located at 43° latitude. On the immediate Atlantic coastline, the mediterranean boundary goes between Porto and Vigo at around 41° latitude. The humid subtropical climate is a subtropical climate type characterized by hot, humid summers with frequent tropical downpours of short duration and warm to cool dry winters. Normally, rainfall is concentrated in the warmest months of the year. At times, the average annual precipitation may be evenly distributed throughout the year (Trewartha climate classification: Cfa) or marked by a dry season or drying trend during winter (Trewartha climate classification: Cwa). Humid subtropical climates lie on the east side of continents, roughly between latitudes 25° and 35° degrees away from the equator. However, the humid subtropical climates can reach as far north as 45° degrees latitudes or even slightly north of that in Europe, due to the warming influence of the Atlantic and the Mediterranean Sea in areas that do not see the summer drought such as in Milan and the surrounding region inside Northern Italy. In Asia, the poleward cool to cold winter-area of this climate type is prevalent in most of Japan, although seldom much farther north than 40° latitude. ↑ I. G. Sitnikov. "1". Principal Weather Systems in Subtropical and Tropical Zones (PDF). 1. Encyclopedia of Life Support Systems. ↑ Glossary of Meteorology (2012-04-25). "Subtropics". American Meteorological Society. Retrieved 2013-03-24. ↑ Belda et al. 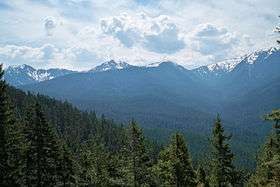 Climate classification revisited: from Köppen to Trewartha. In: Climate Research Vol. 59: 1-13, 2014. ↑ Köppen, Wladimir (1936). "C". In Köppen, Wladimir; Geiger (publisher), Rudolf. Das geographische System der Klimate [The geographic system of climates] (PDF). Handbuch der Klimatologie. 1. Berlin: Borntraeger. ↑ Susan Woodward (2005-02-02). "Tropical Savannas". Radford University. Retrieved 2008-03-16. ↑ Randy Lascody (2008). The Florida Rain Machine. National Weather Service. Retrieved on 2009-02-06. ↑ Remote Sensing for Migratory Creatures (2002). Phenology and Creature Migration: Dry season and wet season in West Mexico. Arizona Remote Sensing Center. Retrieved on 2009-02-06. ↑ J. Horel (2006). Normal Monthly Precipitation, Inches. University of Utah. Retrieved on 2008-03-19. ↑ Greek Embassy London (2008). Welcome to Greece. Government of Greece. Retrieved on 2009-02-06. ↑ D. Bozkurt, O.L. Sen and M. Karaca (2008). Wet season evaluation of RegCM3 performance for Eastern Mediterranean. EGU General Assembly. Retrieved on 2009-02-06. ↑ Ron Kahana; Baruch Ziv; Yehouda Enzel & Uri Dayan (2002). "Synoptic Climatology of Major Floods in the Negev Desert, Israel" (PDF). 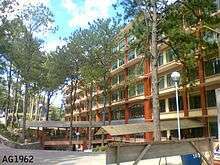 International Journal of Climatology. 22: 869. Bibcode:2002IJCli..22..867K. doi:10.1002/joc.766. ↑ Michael J. Plagens (2009). What and Where is the Sonoran Desert? Arizonensis. Retrieved on 2009-02-07. ↑ Geoffrey John Cary; David B. Lindenmayer; Stephen Dovers (2003). Australia Burning: Fire Ecology, Policy and Management Issues. Csiro Publishing. p. 33. ISBN 9780643069268. Retrieved 2013-03-24. ↑ Whipple, Addison (1982). Storm. Alexandria, VA: Time Life Books. p. 54. ISBN 0-8094-4312-0. ↑ Walter Tennyson Swingle (1904). The Date Palm and its Utilization in the Southwestern States. United States Government Printing Office. p. 11. Retrieved 2013-03-24. ↑ Wilson Popenoe (1920). Manual of Tropical and Subtropical Fruits: Excluding the Banana, Coconut, Pineapple, Citrus Fruits, Olive, and Fig. The Macmillan Company. p. 7. Retrieved 2013-03-24. ↑ R. K. Kholi; D. R. Batish & H. B. SIngh. "Forests and Forest Plants Volume II – Important Tree Species" (PDF). Encyclopedia of Life Support Systems. Retrieved 2013-04-09. ↑ P. G. Tow (2011). Rainfed Farming Systems. Springer. p. 70. ISBN 9781402091322. Retrieved 2013-03-24. ↑ John P. Schmal (2004). "Morelos, the Land of Zapata". Houston Institute of Culture. Retrieved 2013-03-24. ↑ Bureau of Meteorology (2011). "Climate of Canberra Area". Commonwealth of Australia. Retrieved 2011-01-30. ↑ Michael Ritter (2008-12-24). "Mediterranean or Dry Summer Subtropical Climate". University of Wisconsin–Stevens Point. Retrieved 2009-07-17. ↑ "Perth Monthly climate statistics". Australia Bureau of Meteorology. Retrieved 2010-08-02. ↑ Michael Ritter (2008-12-24). "Humid Subtropical Climate". University of Wisconsin–Stevens Point. Retrieved 2008-03-16. ↑ "Weather Information for Barcelona". World Weather Information Service. Retrieved 2010-08-02.